Geographical representations of topographical space come in many shapes and are a regular topic of discussion. The depiction of the invisible and maybe even illusory concept of time on the other hand, remains largely unchanged and undisputed. A uniform and arithmetic model of time fits well with the rigid structure of digital data, which might be why it has been widely adopted within HCI. 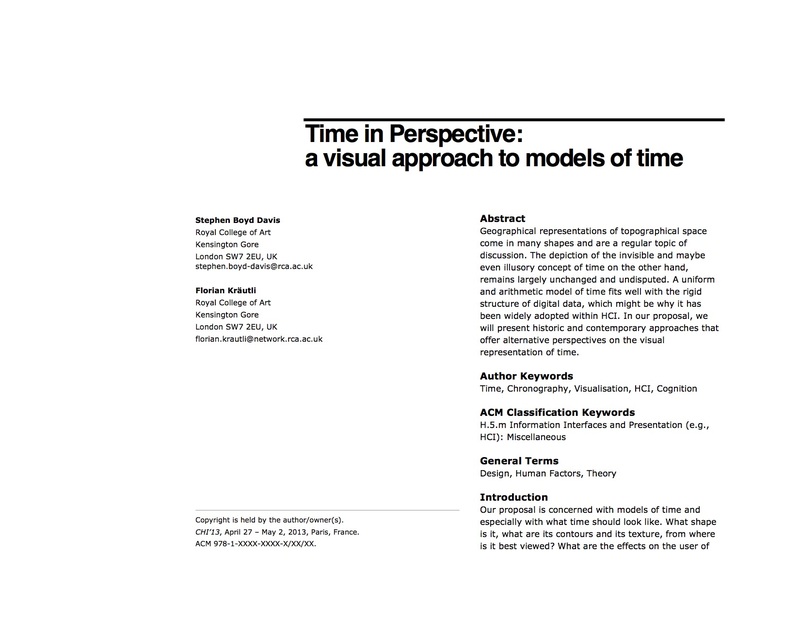 In our proposal, we will present historic and contemporary approaches that offer alternative perspectives on the visual representation of time. Boyd Davis, S. & Kräutli, F., 2013. Time in Perspective: a visual approach to models of time. CHI 2013 Workshop Changing Perspectives on Time. Paris, 27 April - 2 May 2013. New York: ACM. Available at http://researchonline.rca.ac.uk/1617.